Previously, on MinerBumping... Agent Alt 00 hunted and repeatedly punished Lexxos, a miner with a penchant for flying--and losing--the same mining ship in the same place. Lexxos' suspicious activities and dogged refusal to learn from his losses eventually led Alt 00 to believe that he was a bot. Alt 00 had ganked Lexxos for at least the ninth time over a period of months. Our Agent yearned to speak with the bot, but at least Lexxos' death sparked a conversation among the other miners in the system. The miners were relieved that Lexxos, and not they, had been the recipient of the gank. But many of them didn't take the lesson: They still lacked permits. 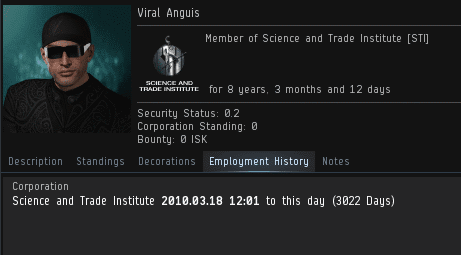 Agent Alt 00 was perfectly willing to sell them permits for only 10 million isk. It seemed that Fezline Wiggins and the rest were too proud--despite being highsec miners. The accusations against Lexxos had given him a bad reputation; the other miners felt themselves above him. After all, at least they didn't bot. Alt 00 reminded the unlicensed miners that the Code has a lot to say about bot-aspirants, too. Suddenly, without warning, Lexxos did the unthinkable. He spoke. Alt 00 was almost too stunned to respond. She had been ganking Lexxos for months without ever hearing the bot-miner utter a word. Now here he was, chattering away in local like any other miner. Our Agent's mission was to transform highsec into the image envisioned/mandated by the Code. If she could get bots to speak, she might get them to buy permits. Could a bot become human? Lexxos stopped talking. Another miner, Rhian Crescent, entered the scene. Rhian picked up where Lexxos left off. Alt 00 had noticed Rhian mining near Lexxos on previous occasions. Now she was confident that Rhian was Lexxos' alt. Since Lexxos was afraid of "feeding the trolls", he preferred to speak through a different character. It was clear that Lexxos/Rhian could no longer resist the temptation to argue with the ganker who had killed him so many times. Our Agent tested the bot-miner by ignoring Rhian for a moment and engaging with one of her many other clients. As Alt 00 anticipated, Rhian was frustrated, angry, and eager to defend Lexxos against the botting accusations. Can a bot feel? People often debate what it's like to "play" EVE from the perspective of a bot-miner. If Lexxos/Rhian was any indication, they can get just as upset as any other carebear--if you gank them enough times. Lexxos had spent months holding his tongue while being killed and called a bot. Now he demanded to see Alt 00's evidence. Speaking through Rhian, he was determined to clear his good name in the courtroom of local chat. Things just keep getting better and better for the New Order. Viirilithizu Ward bought 1,000 more shares of our stock, pushing us past the the 1,595 billion isk mark (so close to 1.6 trill!) and earning her a Supreme Protector's Tip of the Hat™. The Imperium News Network released an article on the kill. The author, Savvy Kneel, interviewed Agent Australian Excellence, who offered some additional insight on how the monumental gank went down. Naturally, there were a few salty commenters. In addition, I'm now in a position to declassify the post-gank information EVEmail that Australian Excellence sent to the jump freighter pilot shortly after the 331 billion isk kill. Hopefully the carebear will take heed and accept the constructive criticism in the spirit with which it was offered. Then again, gank recipients aren't known for being good sports--another thing they could learn from our Agents. Previously, on MinerBumping... A bombshell accusation was made against four Agents of the New Order by miner Viral Anguis. Viral claimed that they were guilty of breaking the rules against scamming new players in rookie systems. The victim? Viral himself. But our Agents uncovered the shocking truth behind Viral: His account was eight years old. When Viral's true age was discovered, it set him back on his heels. Our Agents moved in for the kill. Viral linked an article about the rule against scamming new players in rookie systems, only to have the contents of the article thrown back in his face. The miner was probably beginning to wish he'd simply taken his Mackinaw loss and moved on. Now the litigious miner was on the defensive, challenged and accused by the four Agents. Viral's practice of mining ore in a special "new player" system came under heavy scrutiny. This eight-year veteran was stealing from newbies! The miner had grown quiet. Unable to defend himself, he pretended to be busy writing his petition to CCP. If Viral had hoped to intimidate the Agents, he failed. They were clearly enjoying EVE much more than he was at the moment. In fact, as we saw earlier, Viral did care enough to write an EVEmail directly to the Saviour of Highsec after these events transpired. For now, though, he was apparently composing a lengthy essay to send to CCP. 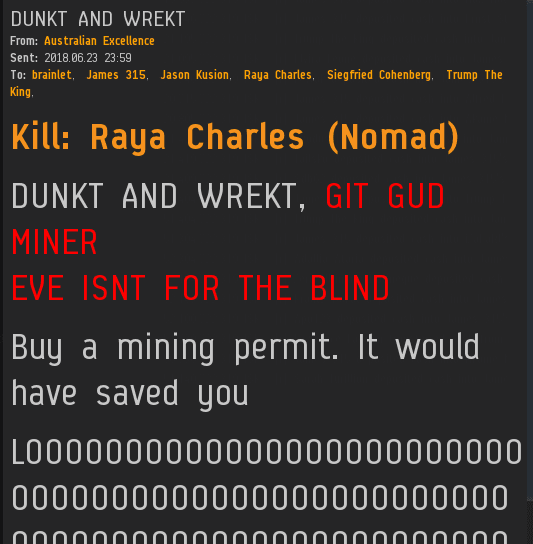 Once again, our Agents had to deal with a miner who didn't mind losing 300 million isk but was really peeved about being asked for a 10 million isk permit payment. Now Viral began his painful effort at backpedaling. Even if he wasn't a newbie, the Agents were guilty of scamming newbies if they didn't know he wasn't a newbie. Finally, the carebear pulled a familiar trick: He tried to classify himself as a "new returning player". But even then, he admitted that he'd logged a few months in the game over the past eight years. He wasn't "a pro or whatever", so he still considered himself a new player. The miner clumsily attempted to craft an argument of some sort, but it got him nowhere. He was stuck. Viral wouldn't accept defeat--or reality. He insisted that selling a permit to an eight-year veteran was rookie scamming. He was just a very, very old rookie. The miner grew frustrated. Why didn't anyone agree with him? He'd explained everything so clearly. At last, Viral gave up and walked away in a huff. If there was any justice in the world, he thought, the people who ganked him would be banned. And, in fact, there is justice in highsec these days--the Code's justice. That's what got him ganked in the first place. As the Father of the New Order and Saviour of Highsec, I am charged with an extraordinary responsibility for the welfare of those who live in highsec--and I take it really seriously. So do the carebears, even if they curse my name in private. I received an urgent message from Viral Anguis, who accused four Agents of violating EVE's Terms of Service. The EVEmail shocked me, since I've known those four to be good and decent people. But if there was any truth to the accusation, bans could be incoming. Since I had nothing better to do at the time, I had no choice but to investigate the matter. 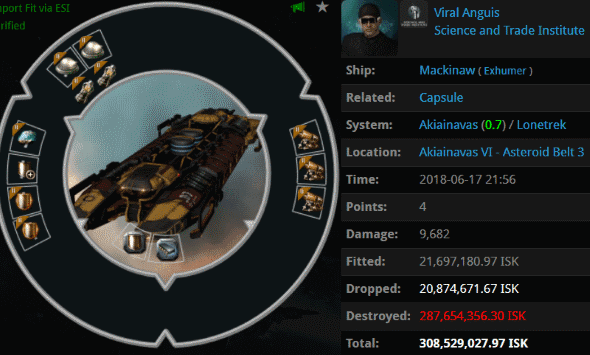 Less than an hour earlier, Viral Anguis lost a Mackinaw to the four Agents named in the EVEmail. 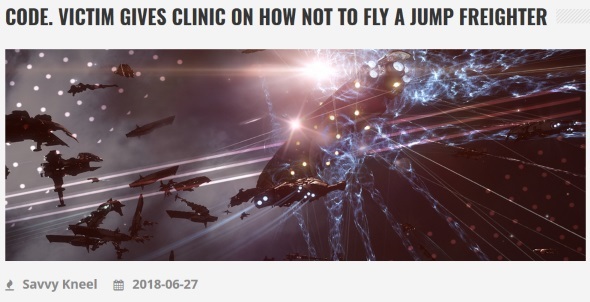 Importantly, the kill took place in the Akiainavas system--which brings us to the CCP article on "Rookie Griefing" linked by Viral. Although there are quite a few systems listed on that page--too many, really--the good news is that the special rules only apply to new players. This raised a question of the utmost importance: Was Viral Anguis a new player? Three thousand days is a long time to be a new player. Nice hat, by the way. As they say, there are two sides to every story. One of the sides is false, and is usually sent to me by carebears through EVEmail. The other side is the true one. That side I get from our Agents. They keep logs. Viral was immediately hostile upon meeting our Agents and experiencing their elite PvP. ...And it wasn't long before he started space lawyering. Though Viral had lost his Mackinaw, he was confident that he'd win the meta game. All it would take was one good petition. The miner was agitated and, frankly, paranoid. He may have had some sort of addiction to illicit ore, which would explain why he was still mining in highsec after eight years. Viral's "newbie" disguise didn't hold up for very long. Apparently he assumed our Agents wouldn't check his profile. Despite being unmasked as a veteran, Viral was committed to his course. It was too late to turn back now. Viral was extraordinarily stubborn. 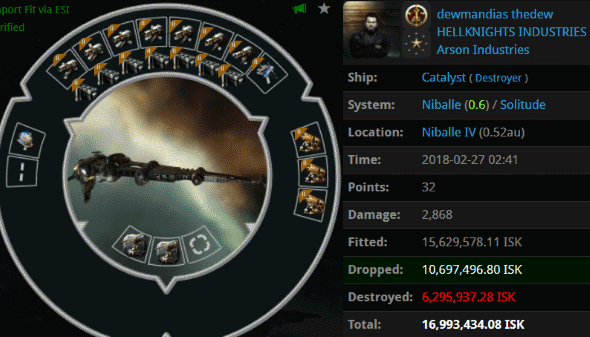 It didn't matter that he'd been in EVE for eight years. He had insisted that he would get our Agents banned for scamming a rookie. All he could do was double down on that claim. This meant that there was a very real possibility that he would need to repeatedly humiliate himself in a lengthy conversation with our Agents. The miner linked the very article that exonerated our Agents by specifying "new players" over and over. He urged them to read it. Unfortunately for the miner, they did. Having lost his ship in battle, Viral was anxious to win the war of words. 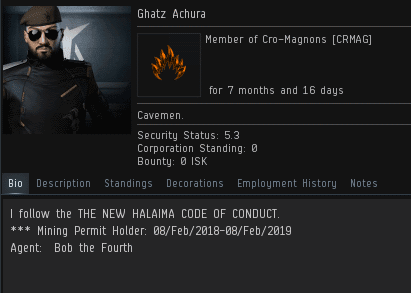 Could he persuade our Agents that trying to sell him a mining permit was a violation of the rules that protect "new players"? Previously, on MinerBumping... Agent Bob the Fourth's triumph in the Niballe system humiliated the anti-Code rebels hiding there. Building on his successes, Bob sought to create a new, Code-compliant society. Public opinion turned in Bob's favor. Instead of always being cursed whenever he entered local, Bob drew cheers--and cheers for highsec's Saviour, of course. Bob was about to launch into a new gank when he noticed something peculiar: the presence of CONCORD ships that he hadn't generated himself. To Bob's great surprise, news came of an unknown ganker--someone not affiliated with the New Order. The report turned out to be accurate: The lossmail of the failed ganker proved it. 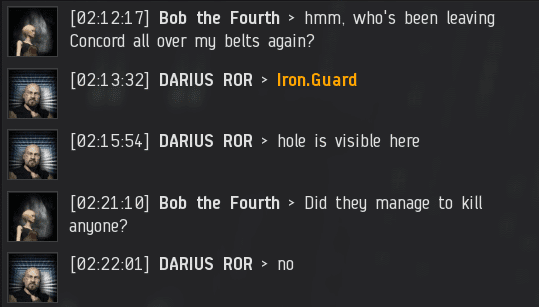 Bob then went back to his logs, which had faithfully recorded everything in local chat during his absence. Bob was amazed by the attitude of the would-be ganker from nullsec. It was immediately obvious that someone had witnessed the adventures of our Agents without realizing that ganking really is elite PvP. The failed ganker assumed it would be easy, and that it could be done without the Code. He had no idea how difficult it would be to gank even a Retriever piloted by a Code-compliant miner. It wouldn't be the last time Bob came across a swarm of foreign CONCORD ships. 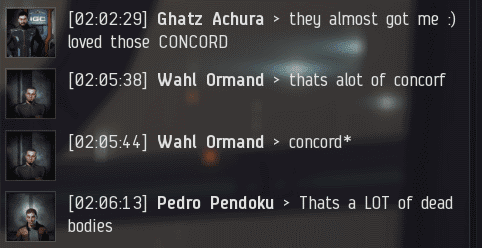 This time, a whole gang of amateur suicide gankers had created a mess of CONCORD--again botching the gank. Upon reviewing the logs, Bob was again struck by the amateurish nature of the individuals involved. These were not elite PvP'ers. Witnessing their clumsy attempts at a gank, Ghatz must have thought to himself, "I know James 315 and I know the New Order, but who are you people?" Bob couldn't help but be amused. Rebel miners always say that the Code is useless and that mining permits are a scam. Yet here was living proof that only the Code can keep a miner safe. Moreover, the failure of these tourists proved that the mighty CODE. 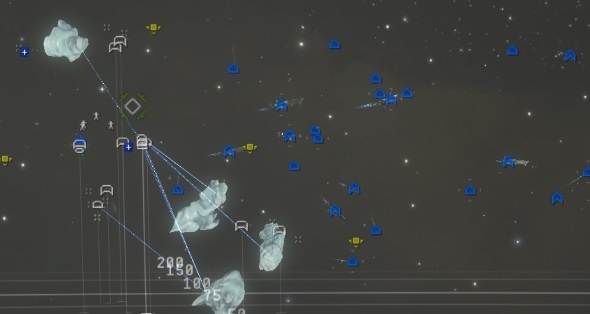 alliance isn't alone in killing trillions of isk worth of miners merely because other people can't be bothered--we stand at the pinnacle of ganking success because others can't pull it off. As Bob took command of the scene, our Agent found it even easier to sell mining permits. Everyone in the system could see that the Code works. Miners were lining up to buy permits and get Code-compliant now. Bob had achieved his goal of creating a pro-Code culture in the Solitude region. But there was still one great old enemy he would have to face.